1907 Railroad Shipping Receipt - Tidewater Railway Company. (385) 1907 Railroad Shipping Receipt -Tidewater Railway Company, Norfolk, VA.-Condition: Good Full sheet folded 4 times across length. Staple mark at top. 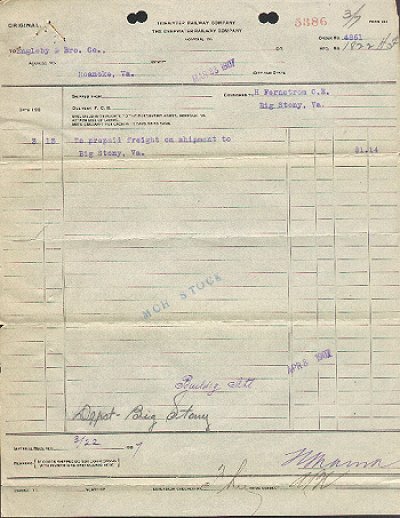 This sheet was a receipt for prepayment of item to be shipped from Big Stony, VA. Cost was $1.14. Size is 8 1/4" by 11". Price: $5.00 + shipping.